The Dymo MobileLabeler is a labelling device that connects via Bluetooth to a smartphone. It will have countless uses in the home or workplace, where multiple users can connect to the device using a phone. The quality of the labels is good, though the device inserts a wide margin, wasting tape. The free app has a number of useful features that will improve the efficiency of production, and the quality of the labels is high, with a range of fonts and graphics easily accessed via the app. For a portable device, it is quite heavy, and it can be hard to understand the controls when first purchased. The Dymo MobileLabeler measures 12.3 x 21x 20.5 cm and weighs one kilogram. It can connect via a USB cable or Bluetooth for a wireless connection, and it is powered by a rechargeable lithium ion battery. The device prints using thermal transfer technology to a resolution of 300 dpi. It takes five label widths, ranging from 6mm to 24mm. 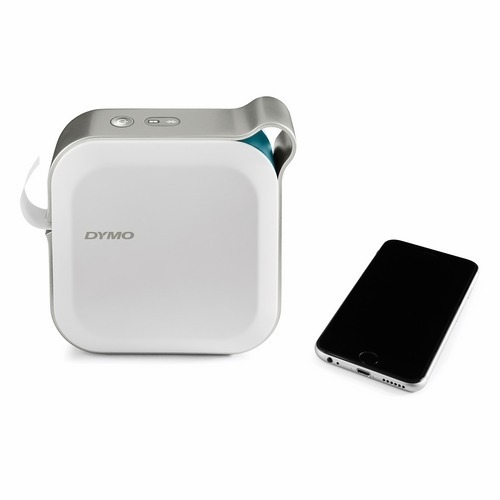 With an app available for both Apple and Android, the Dymo MobileLabeler connects quickly thanks to the Bluetooth connection. The free app offers a wide range of fonts and borders. It also has useful features such as voice to text and spellcheck. A rechargeable battery keeps the running costs low. An automatic cutter creates labels of the correct size and makes multiple label printing an efficient task. The durability of the standard labels printed using the Dymo MobileLabeler is not high if the labels are to be exposed to extreme conditions such as a dishwasher. The controls are complicated, which can be frustrating when it is first purchased. Layout options are limited. It is quite large and heavy for a labelling machine, and tips over easily. The space inserted at the start of each label results in considerable wastage.